The information on this page was researched and compiled by Historic Denver volunteer and sandstone enthusiast, Diane Travis. 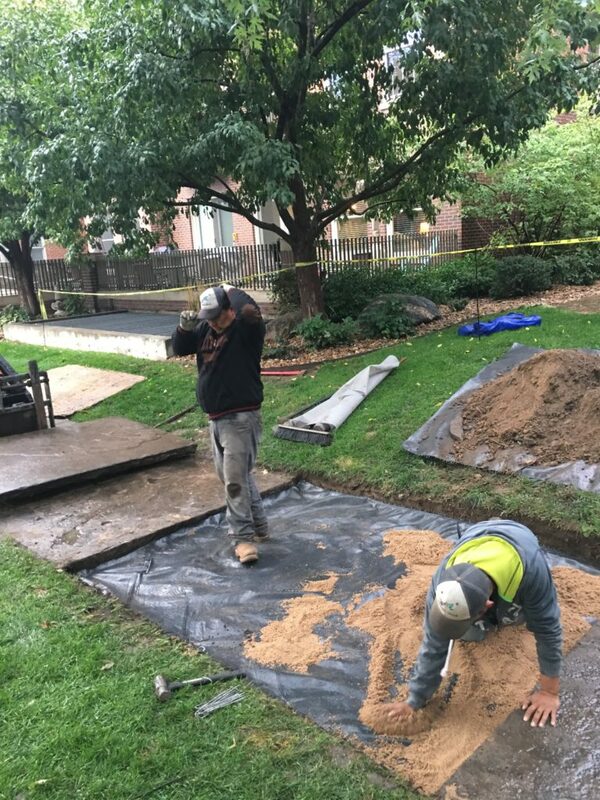 She has worked with contractors and the city to repair the flagstone (made out of sandstone) sidewalks in front of her 126-year-old Victorian, located in Denver’s Uptown neighborhood. 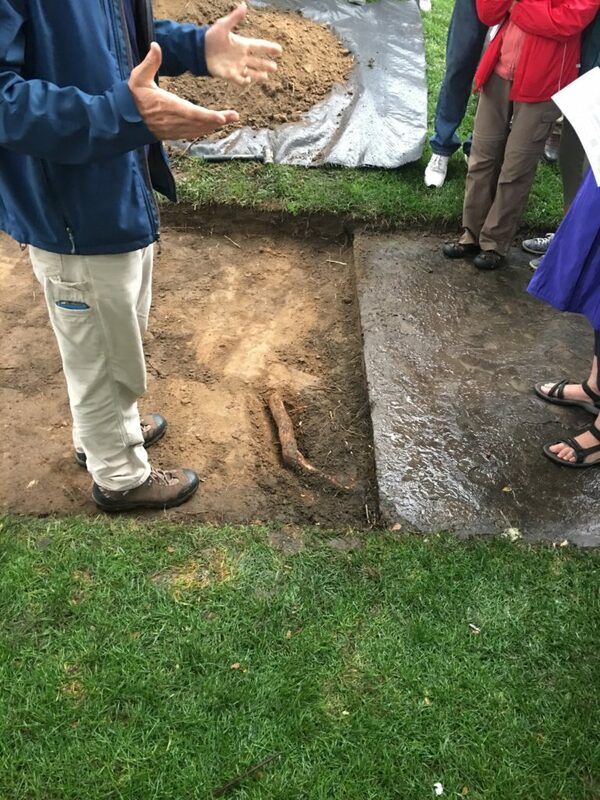 See Diane’s flagstone sidewalk slide presentation. See her list of recommended resources, including contractors and sources of information. 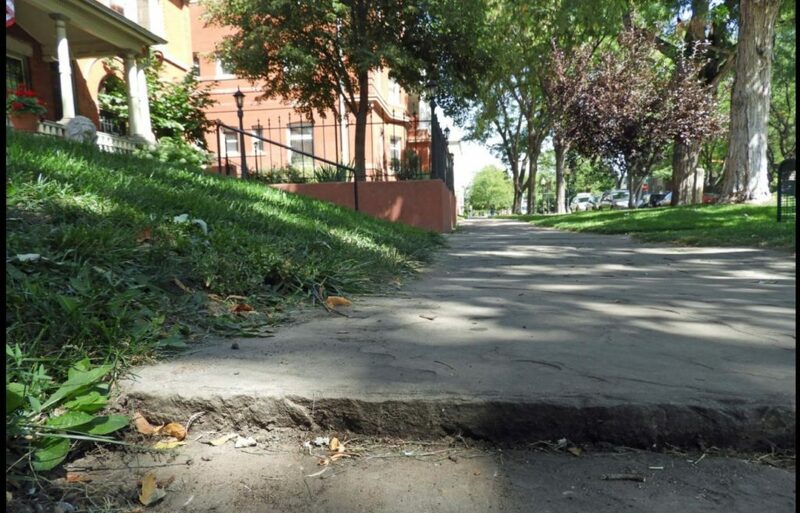 The city of Denver is sending out inspectors to review the condition of sidewalks in central Denver. They will check the condition of the public sidewalk in front of your home. (They will not check the walk leading up to your home, or the paving from the sidewalk to the curb; they are only interested in the public sidewalk.) Inspectors are looking for sloped, broken, uneven or misaligned slabs of sidewalk. 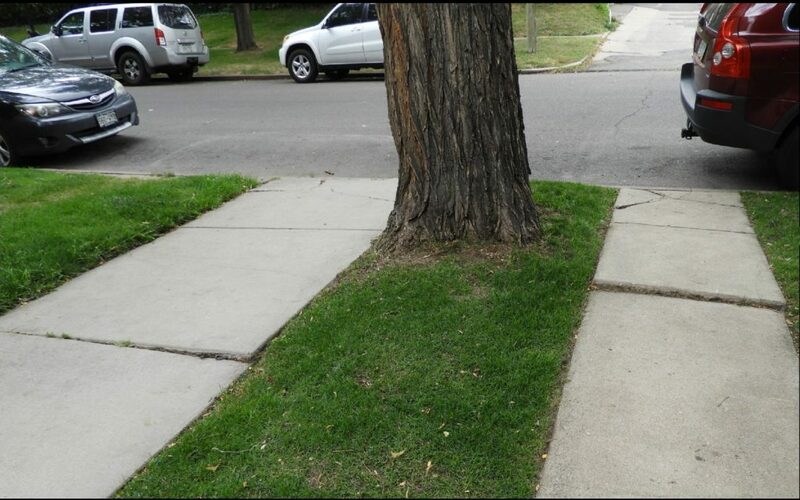 If any portion of your sidewalk is lifted more than ¾” from one slab to the adjacent slab, this is considered a “tripping hazard” and the stones need to be re-leveled. If a slab of stone is shattered into several pieces, it is deemed beyond repair and the slab will need to be replaced. Note: Flagstones refer to the shape of the stone. Most of the flagstone sidewalks in Denver are made out of sandstone, sourced mainly from Lyons, Colorado. This method involves lifting sunken slabs without actually picking them up. 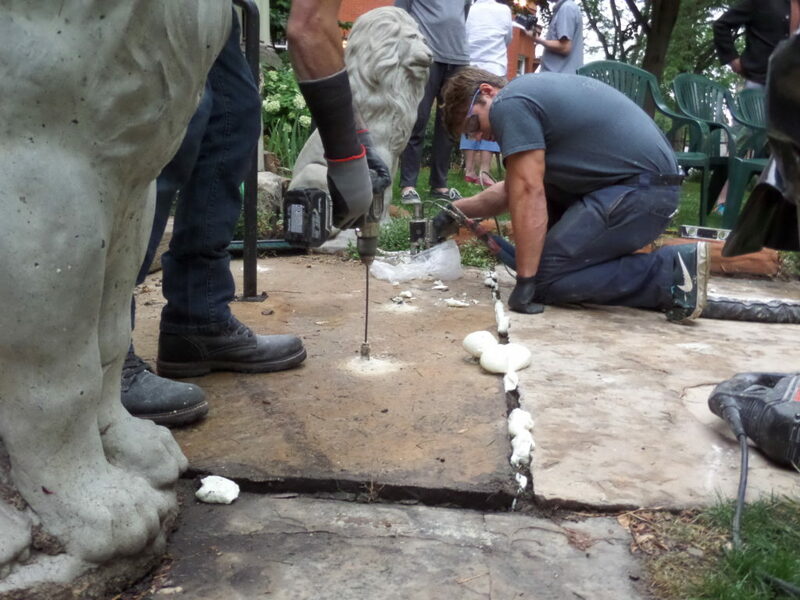 The foam-jacking team will drill small holes (5/8”) through the stone slabs and inject a liquid 2-part polyurethane foam underneath the slab. This product is similar to the expanding foam in shaving cream. As it expands, the foam will gently lift the slab. Once enough foam is inserted to lift the slab to the proper height, the foam will harden within minutes. 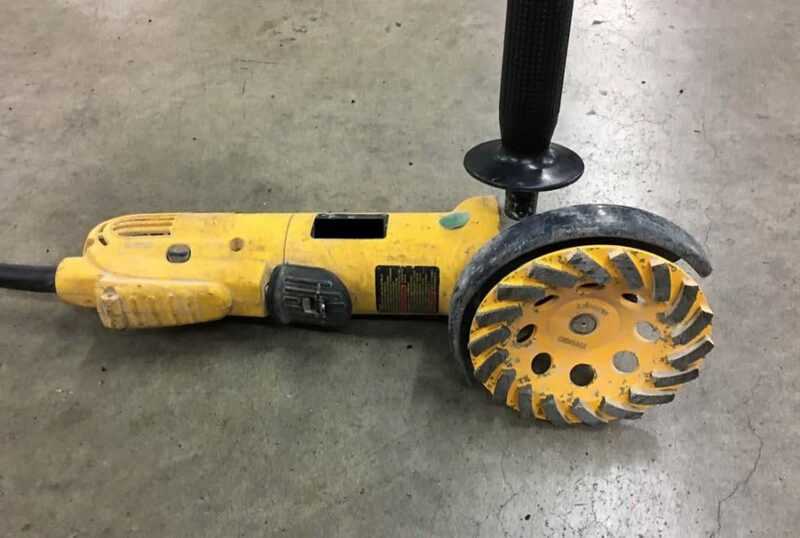 If you hire a mud-jacker to align your slabs instead of a foam-jacker, he/she will drill a larger hole (1-1/2”) and inject liquid concrete instead of foam underneath the sidewalk. You can walk on a mud-jacked or foam-jacked sidewalk immediately after the job is complete. Sometimes the best remedy for sloped or sunken slabs is lifting them out of place and adjusting the ground underneath. If the slabs are small (3’ x 4’) you can do this work manually. If they are larger slabs of stone, you would be wise to use mechanical assistance from a forklift machine. Once the slab is removed, dig a few inches of dirt out from the exposed pit. Use a tamping device to compact the soil. Add a couple inches of crushed gravel and tamp that down, too. Then cover the gravel with a layer of rot-resistant geotextile fabric (landscape fabric). This mesh keeps the sand from settling into the cracks between the gravel. Add an inch or two of sand. This sand will settle to adjust to the uneven surface under your stone slab. Measure carefully to make sure you have the right amount of sand. Measure your slab at all four corners; then measure your pit at all four corners. Your goal is to reset the stone and have it sit perfectly the first time. It is not fun to repeatedly lift the stone out to add or subtract sand. While grinding down a raised edge of pavement works well for homogenous materials like concrete and granite, it is not recommended for sedimentary stones like sandstone. Sedimentary stone was formed at the bottom of an ancient lake bed. Silt was deposited in successive horizontal layers. Some layers are stronger than others. Sedimentary stone tends to delaminate in sheets when a weak layer of the stone is exposed to freezing moisture. Grinding the edge of the sandstone exposes those weak planes to moisture, leading to premature failure. It must be replaced. If one of your slabs is shattered into multiple pieces, it cannot be repaired or re-leveled. If 30% of your walk needs to be replaced, it is probably most economical to remove the whole walk and replace it with new sandstone. There are two masonry salvage companies in Denver (Hillen Corporation and Mendoza Used Brick and Demolition) that will remove the stone for you. They will then resell the large pieces of stone to another homeowner. This is a sad outcome, but it is better than sending the stone to the landfill. The vast majority of flagstone used for Denver sidewalks are sandstone slabs quarried from deposits near Rocky Mountain National Park. Generically, it is called Lyons Sandstone. It’s sold by a number of quarries (you can see a full list of suppliers at www.denvergov.org/sidewalkrepair). This sandstone varies in color from grey to rose, and is unusually hard, dense and water-resistant. Many of the flagstone sidewalks in Denver are more than 125 years old. A large portion of the cost of the stone is the delivery fee (typically $400). It costs the same amount to deliver one slab or a dozen of them. You can save a lot of money by banding together with neighbors who also need a slab or two. While the city requires a 4” thick concrete sidewalk, some believe that it would be adequate to use 3” thick stone for sidewalks and 4” thick stone when the walkway crosses a driveway. (You need stronger slabs because cars weigh a lot). Although the city officials said they would consider changing their requirements, at present they still require 4” thick stone for sidewalks and 6” stone where the sidewalk crosses a driveway. Contact Denver Public Works to inquire about their latest ruling on this matter. According to the forester, trimming a root can actually be counter-productive. The tree will naturally sprout multiple new roots at the site of the amputation, causing even more aggressive root activity. For more information, contact the city forester at forestry@denvergov.org or 720-913-0651. If you are blocking the public sidewalk or if you are using machinery, you will need a permit. 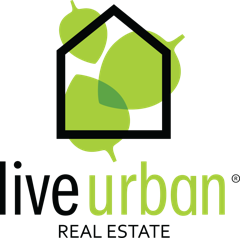 Homeowners can obtain a permit at no cost. Contractors are charged $50. You can file online at www.denvergov.org/sidewalkrepair. File for your permit early; it takes a minimum of five working days for the city to process your permit application. The Department of Public Works will deliver four sawhorse-style signs to your house the day before your construction starts. Put two of these signs on the sidewalk at the ends of the block. The other two should be placed on the sidewalk just beyond your construction zone.